Cal has become great friends with Willow. Willow is a wonderful resident at Happy Trails. She can leap tall fences and was the reason for some recent updates! We would love for Willow and Cal to be adopted together. This lovely pair can be your charge and will offer many special moments to cherish. 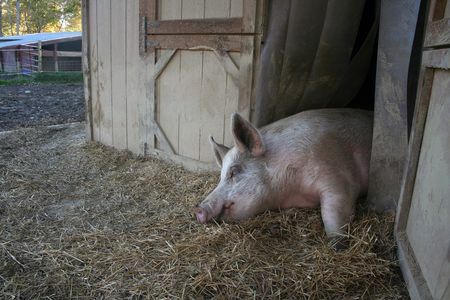 Practical came from a neglect situation with three of our other farm pigs up for adoption. Temple, Practical, Fifer and Fiddler are all like family and ideally we would prefer that each of them leaves with at least one of their friends. When Practical came to Happy Trails, he had to be treated for an upper respiratory infection and also had to have ear tags removed. He is the baby of the four and a very nice little pig.